It’s Time to Test and Earn! 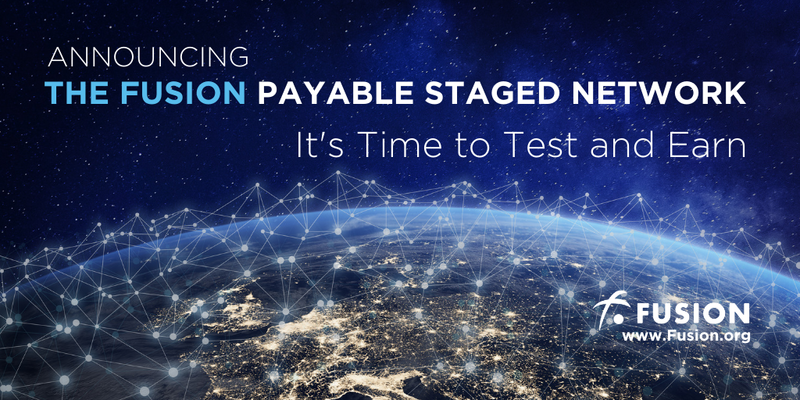 Fusion is excited to announce the upcoming launch of its Payable Stage Network (PSN): The PSN will allow our community of early adopters to see how Fusion technology solves the challenge of interoperability by enabling cross-border, cross-ledger, and cross-asset transactions on a secure, globally accessible platform. The Fusion Network opens a window to exciting new possibilities. The PSN approach is a way to fully test the network before migrating to a secure and robust main net. Running nodes on the PSN earn rewards in both PSN (P-FSN) and in ERC-20 FSN tokens. ERC-20 FSN rewards are paid from the community allocation of FSN tokens until main net goes live. During PSN, the Ethereum blockchain will continue keeping the ledger for real ERC-20 FSN tokens until the main net token swap. The ERC-20 FSN remains the tradable token of value during PSN until it’s swapped for native FSN tokens upon main net launch. Further details on the FSN token payment process and reward structure will be disclosed in a future Fusion article. Fusion will take a snapshot of the Ethereum block at block height 6,868,000. This snapshot will serve as the PSN genesis block balance. Based on the number of ERC-20 FSN tokens at block height 6,868,000 of Ethereum in each public address, PSN tokens (P-FSN) will be automatically sitting in the same public address as every ERC-20 FSN holders are using now. And of course, the private keys remain the same. Fusion will release instructions with details about how to use your current private key/ keystore of ERC-20 FSN to access PSN tokens(P-FSN) in an upcoming article. For those wanting to participate in the PSN testing program: Please keep your ERC-20 FSN in a wallet whose private key is in your control at the moment that Ethereum generates its 6,868,000th blocks. If your ERC-20 FSN tokens are in exchanges now, please withdraw to your own wallet and keep your tokens in your wallet until Ethereum generate its 6,868,000th block. As a reminder, those who control the private key of your current ERC-20 FSN tokens will be the one who receives the PSN tokens (P-FSN). Fusion has four main goals for the PSN. Validating the platform. We want the world to see and test how Fusion technology can securely support the interaction of trillions of dollars in asset value. Testing features and functionality. By participating in the PSN, the community will stress-test, identify bugs, explore potential security vulnerabilities, enable regression testing, and refine the user experience. The rigorous quality assurance process must be performed on the PSN in order to determine when the Fusion mainnet goes live. Proving the utility of the FSN token. By swapping no-value PSN tokens, generating universal short account number, using smart contracts, time-locking assets, issuing new tokens, using the Fusion Wallet, staking, running automated testing scripts, and running nodes; participants will validate the utility of the FSN token and the Fusion network. Validating the security of the Fusion platform for the token swap. It’s Fusion’s responsibility to ensure the token swap is safe, auditable, and convenient. In the PSN environment using non-value tokens (P-FSN), Fusion will test the token swap process prior to launching the Fusion main net. Below is a sample of some of the new features and functionality that will be exposed on the PSN. In-depth information on these features will be shared in the coming weeks. The Fusion Wallet: Based on the popular open-source My Ether Wallet (MEW), Fusion will show how it has adapted the traditional MEW into a new advanced version including an updated interface. The Fusion wallet will support multiple assets, time lock functionality, and the Universal Short Account Number which simplifies wallet and asset management. All of these open-source adaptations will be shared on GitHub. Staking Made Simple: For those wanting to run a node on the PSN, Fusion aims to make the process simple. By providing configuration support and a Docker GUI for AWS, Microsoft Azure and other cloud platform, setting up and running a node is user-friendly. “Auto buy” ticket functionality offers an intuitive solution for users who are running a node to participate in entering the pool of nodes authorized to clear blocks. Asset Creation: Participants will be able to create their own assets. Examples include, concert tickets and rental time in a vacation home. These assets can be stored, exchanged or swapped on the PSN using the Fusion Wallet. Quantum Swap: One of the most exciting features of the PSN is the introduction of the Quantum Swap functionality accessed through the Fusion Wallet. Users can make their assets publicly available to swap, or create private pools with selected users to exchange their non-securitized assets within the pools. Time-Lock: PSN will support time-lock functionality through the Fusion Wallet. Users can time lock their PSN tokens or other tokens generated on PSN and “lend” them to other users for a range of use-cases including staking. Universal Short Account Number: Managing the Fusion Wallet that supports multiple types of assets is simplified with the ability to generate a custom short account number. Gone are the days of managing and remembering long, separate account addresses for each type of asset. Fusion Testing Structure: Based on the idea of test-driven development, Fusion will provide a range of automated scripts designed to test features and functionalities on the PSN. Automated scripts allow for results to show while testing platform features. The automated scripts are written in Truffle, a popular framework for building scripts and smart contracts. This approach allows for users to test node functionality, for the system to process a range of transactions, and for developers to create new testing scripts. This process is an efficient way for a validated Fusion script library to build over time. Tools and Documentation: Because the platform is open-source a range of tools and documentation will be available on GitHub including: a GUI wallet application, monitoring tools, a block explorer, the auto-buy ticket program, Web 3 documentation, a Web 3 SDK, and MTM package explaining to Java Script developers how to connect to servers. Over the next few weeks, Fusion will be releasing more detailed information on the reward economics, staking, ways to earn on the PSN, the bug bounty program, features, functionality and more. The Fusion team is focused on tech delivery and moving quickly to release information on what we believe is going to be the project to watch in 2019! • ERC-20 Supported Wallet WITH a Private Key/Keystore Controlled by You! FSN token holders who want to join the Test and Earn Program on Fusion’s Payable Stage Network must have their FSN tokens stored in wallet whose private key is personally controlled! A popular ERC-20 token wallet is the My Ether Wallet (MEW). The moderators and community members on the Official Fusion Telegram Channel are available to help with questions and to help advise on the the process for transferring FSN tokens to MEW.